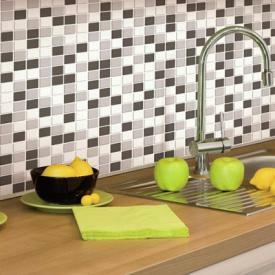 ‎ When you want to create big design impact without a big commitment, try using peel and stick wall decorations. Wall stickers have surged in popularity because they are affordable and easy to use and are a great way to personalize a room without making permanent changes. Take your walls to new levels with removable wall stickers. Peel and stick wall decorations can include graphics, words, phrases, wallpapers, borders, murals, or other styles. They can range in size from just a few inches to full wall mural size. Almost any theme for an adult's room or kids' bedroom or playroom can be enhanced with this and other types of wall décor. Licensed wall decals and stickers include sports teams, colleges, Disney characters, and superheroes. Wall stickers can also be used to decorate furniture, boxes, mirrors, and even tiles. Most wall peel and stick decorations adhere to any smooth surface or may possibly hold on to rougher surfaces though each brand is slightly different. There are countless designs available along with options for customizing with your own photos or drawings. Websites like Words Anywhere have a dedicated section for customizing word art projects to your specifications. Posterjack lets you upload your photo for a unique one-of-a-kind mural. It's simple to use peel and stick wall decorations. They are easy remove, making it easy to reposition until you get it placed just right on your wall. Not all peel and stick decals are reusable, so be sure to check with each manufacturer. There are several ways to use this type of wall decorations in any room design. If you have limited windows, you can create the illusion of a window; it could be either with an entire wall scene or a small open window for the feel of a large picture window. To complete the illusion, you can frame out the full wall mural and even add a curtain panel on either side of the mural. Some stickers even come with the window frame as part of the graphics. 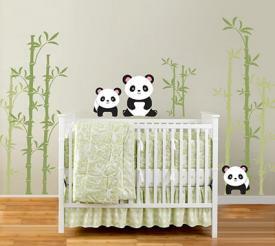 Make a whimsical nursery with a wall decoration placed so panda bears seem to be resting on the crib railing. Make a bold statement on a stairwell wall with a black and gray oversized floral display. Use various peel and stick decals along the hallway and frame as though they are actual paintings. Paint faux frames or use real ones. You don't have to be serious about all the decorations in your home. 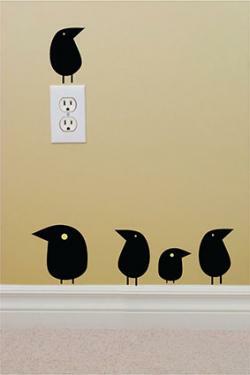 Opt for a touch of whimsy like two birds resting on top of light switches or heating and air conditioning thermostats. Go for the unusual with a couple of candelabra along the mantel wall or butterflies fluttering up the wall where your trash can rests. You can use peel and stick wall decals on things other than walls. Create children's name out of alphabet decals for walls, cubbyholes in the mudroom, and even lunchboxes. Decorate plain storage boxes and trays with colorful graphic decals. Celebrate special occasions and holidays with decals on windows, mirrors, and even presents. Children can personalize their rooms with a monogram and princess crown graphic in their favorite accent color. Decorate furniture with border decals instead of stenciling. Transform a plain toy box into a colorful one with decals. Make use of a shadowbox with a graphic sticker. Use for house numbers on the front door or place on window side panel. Word art and graphics can be used on stair treads for a cool look; consider using book titles, a line from a favorite poem, or music lyrics. Make a statement about your personality, belief or even to accentuate the purpose of the room. For example, Chromantic's New York State decal offers a dramatic wall decoration resembling a torn photo fragment wall sticker that features the Brooklyn Bridge. This wall space is designed to create a vignette to play up the yellow leather Barcelona chair. Instead of using typical framed wall art, this decal is in keeping with the modern dynamics of the famous design of the Barcelona chair. Add a potted plant to the side and what was a forgotten blank wall is transformed into an interesting place that invites a quite respite. Save on bedroom furniture by using a simple metal bedframe and a wall decoration instead of a headboard. This can create a great design for your bedroom that's fresh and stylish. 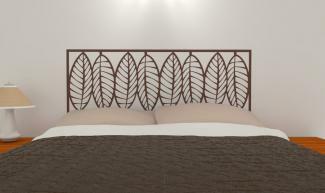 For example, you may go for the natural appeal of an oversized leaf patterned headboard. Add other leaf motifs, such as lamps, pillows, framed leaf stencils or even a leaf throw rug to carry out the leaf theme. You may decide to create your own headboard using a floral or oceanside decal. Forget the chalkboard paint. 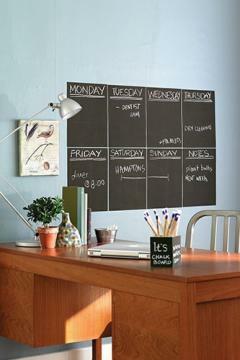 Stick a slate gray chalkboard sheet or two on the wall for an instant chalkboard. These can be used individually or in a group. Place on the wall beside your desk to create a weekly to-do list that's easily used and highly visible. Use in a pantry to help keep stock of your inventory. Use as a message board in the mud room or kitchen. Place inside a kitchen cabinet or wall for an instant grocery board or a weekly chore list for the kids. Use several on the wall of your child's bedroom or playroom. Create your own messages or cut and use for storage boxes, canisters, and other storage containers. There are numerous retailers and websites that carry peel and stick wall decorations. Local home décor stores and boutiques often sell a selection of wall stickers in the most popular designs and phrases. Even hardware stores like Lowe's and The Home Depot have wall stickers in their wallpaper or home decorating departments. A website like eBay will likely have the widest selection and customizable options. Before buying any wall sticker, be sure to double-check the size of the appliqué and the installation instructions. Below are a few of the top brands of wall decorations on the market. If contemporary art is your thing, then the funky stickers from Wall Pops will be a winner for you. They make a variety of mix and match peel and stick wall decorations to create a fun modern room design. Colorful decals come in all kinds of shapes and designs, such as flowers, hearts, word art and more. There is also an interactive design feature where you can "Create a Design" to test out. 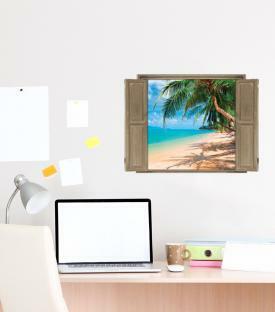 To see some wonderful decorating ideas, check out the Wallies for unique wall décor products. They offer peel and stick chalk labels, chalk sheets, decals, sticker art, and wall murals. Each Wallies specialty line features top-notch design and an impressive diversity. There is something for everyone, from sophisticated to whimsical wall stickers. 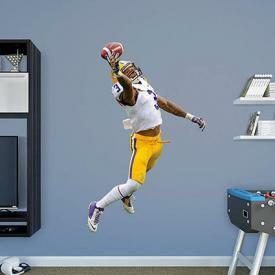 If you're looking for amazing photo-like graphics, Fathead may be the answer. They feature peel and stick wall decorations in life-size high definition color. Many of their products feature sports themes, but Fathead also has Disney characters and comic book heroes. They carry something for nearly every sports league and numerous collegiate themes as well as various wall murals. The designs from are high in color and dynamic. Chromantics is a family business of artists and designers. You'll find that the Chromantic Wall Kits are printed on adhesive vinyl fabrics. Many of the designs feature a high artistic flair. The processing time for your order may take a few days longer than typical since all the kits are "made to order". RoomMates has it all, including wallpaper, full wall murals, kitchen tile backsplash decorations, Disney characters, and iconic superhero choices. You might desire a tropical beach scene over your soaker tub or a pastoral Tuscan hillside on a dining room wall, and you'll find it from RoomMates. It's not surprising that the massive website All Posters features a large and varied selection of various stick and peel decals and wall decorations. There's plenty to choose from for adults and children to help create the home décor you desire. Wall decorations aren't new. Even the Romans enjoyed enhancing their decor with mosaic tile murals and vignettes. The modern twist to this type of home decoration has benefited from the stick and peel technology that allows you to instantly transform a room with the added ease of removal when you decide to redecorate.